RICHMOND, Mo. 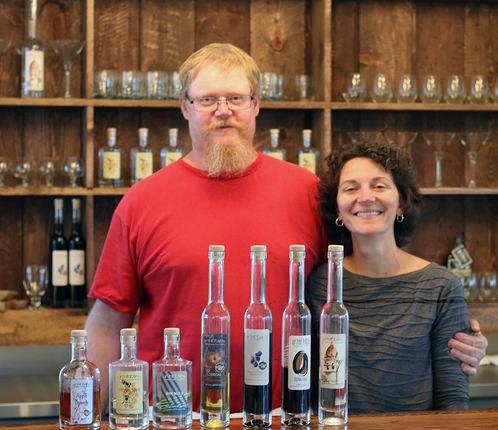 — Jim and Sarah Pierce, who own Of the Earth Farm Distillery in Richmond, Mo., create their brandy and liquors from the fruits grown at their family orchard. Of the Earth Farm Distillery was started after Jim and his father traveled to Nebraska for a fruit conference and learned the best way to add value to their fruit. A conference highlight was a presentation about turning fruit into spirits – and the wheels began to turn in Jim’s head. “I think doing nontraditional things are interesting,” said Jim. “You can take spirits and all the different kinds of products made around the world and replicate them. As an entrepreneur, you take the raw material growing around you, for instance the variety of raw products within the State of Missouri, and make it into a unique product.” Jim said. To capture the energy from their conference inspiration, Jim and Sarah utilized a Value-Added Grant from the Missouri Agricultural & Small Business Development Authority (MASBDA) to have a feasibility study, marketing plan and business plan conducted to make sure the distillery was in their best business interest moving forward. After the initial grant was completed, Jim used MASBDA’s Agribusiness Revolving Loan Fund for financial assistance to get the business up and running. In the years following, Jim applied for an additional loan from MASBDA to remodel a building as a place for customers to visit and taste product. The building has now expanded in purpose and houses distillery equipment and products. Most recently, Jim used the MASBDA’s Bridge Loan Program to help get a high tunnel growing system installed on the farm, which he plans to use to grow fruits and vegetables that will help him test new flavors for his liquor line. Jim and Sarah have grown their business over the years and hope for continued growth in the future. They expanded their workforce and began training their new employee, who is now one of the few woman distillers in Missouri. Jim and Sarah would like to expand their business to include additional equipment, storage, barrels, unique fruits and vegetables and even more employees. However, they still find marketing to be one of their biggest struggles. “Marketing is a challenge,” Jim said. “Anyone can grow the raw products. It is marketing that will set you apart from the rest: understanding how much you can sell, where and how you are going to sell it, and what your message is going to be. Even though Jim and Sarah have seen some setbacks, they are happy with their progress. They both feel that the best advice they can give to businesses sharing similar struggles is to ask for help. For more information on the Value-Added Grant, Agribusiness Revolving Loan Fund, Bridge Loan or other financial assistance programs MASBDA offers visit Agriculture.Mo.Gov or call (573) 751-2129.